Thousands of school youngsters and the city today mourned the passing of Capt. 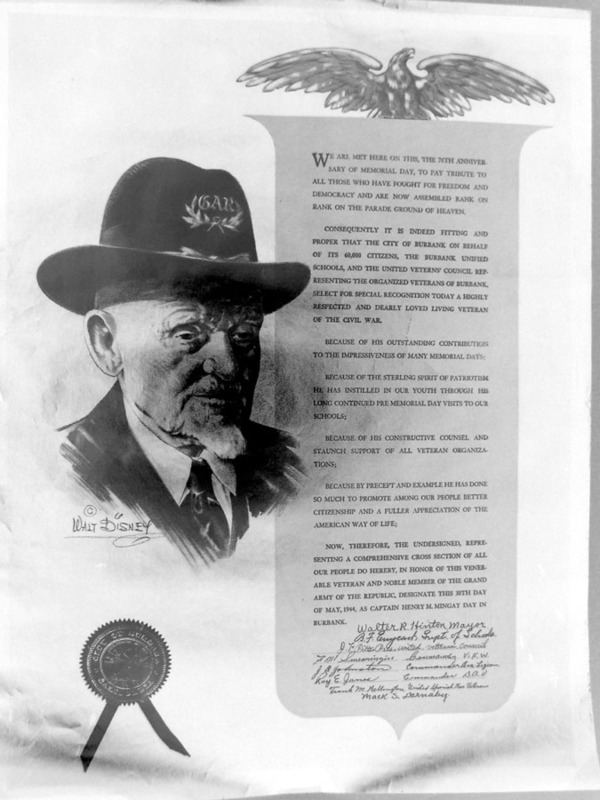 Henry M. Mingay, 100-year-old Civil War veteran, last survivor of the 69th New York Infantry and of the Glendale N. T. Banks post. He died yesterday at Sawtelle veterans Hospital. He was one of eight surviving Civil War vets left in the state. Utter-McKinley mortuary in Glendale will be in charge of the services which are pending. The Board of Education, In a statement issued today, said it "recognized again the tremendous influence of this soldier" on school children and expressed its sympathies to members of the family. In public ceremonies Dec. 5 1946, the city had officially dedicated the elementary school at Allan and Maple in Capt. Mingay's honor. The student body, representatives from the various veteran organizations and school officials had participated in the fete. Three oak trees, symbolic of the old soldier's strength and stamina, were planted and youngsters gave him gifts. The aged veteran had urged the youngsters to "be good." Capt. Mingay had appeared before countless school assemblies for over a quarter of a century, contributing much to instill in youth of this community an appreciation for true democratic principles and love of country, the board's resolution read. Capt. Mingay, although failing in sight for the past several years, had enjoyed good health until recently when he broke a hip and was confined to his bed at the family home, 804 E. Elk, Glendale. Born on Dec. 3, 1846 in Filby, England, the fourth son of Richard and Ruth Mingay, the boy and his family left for New York four years later in August, 1850. It took them six weeks to span the Atlantic in the old sailing vessel, "America." He left school in 1860 to become a bootblack and printer's devil on the Saratogian, Saratoga Springs, N. Y. When the Civil War broke out, he was refused enlistment because the "army is not signing up children." But he got by on his second attempt and was sworn into the 69th Regiment. He saw action in all the regiment's many battles and was mustered out as a sergeant. He was wounded in the right arm. Later he was commissioned a first lieutenant and was advanced to captain. He left New York for Colorado in 1885 with his wife and family and went into the printing business at Alamosa and Canon City. In 1914, the Mingays moved to, Inglewood, later to Monrovia, Tujunga and finally to Glendale. His wife Emma passed away in 1924 followed by a daughter Edith in 1933. Mingay was married again in August, 1945, to Aimee Cleveland Hennessey, who survives him. 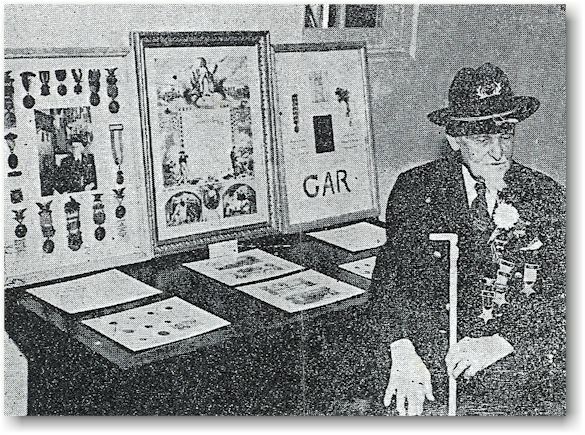 He was a peppery little old guy with gleaming white hair and pink cheeks who loved nothing better than to deck himself out with half a dozen Civil War medals and give patriotic pep talks. Around Memorial Day each year, Capt. 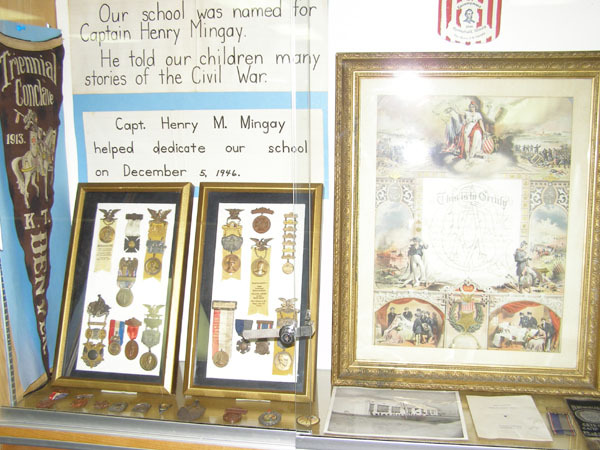 Henry M. Mingay would make the rounds of the local schools, telling the kids what a grand country they lived in and how great it was to be free. Capt. Mingay is dead and gone now. But he's not forgotten - not completely anyway. Children at Henry M. Mingay Elementary School in Burbank revived his memory this week by placing a large spray of gladioli, carnations and daisies on Mingay's Grand View Memorial Park grave. Each of the 450 pupils took a nickel or dime to school to pay for the flowers, and three youngsters made the trek to the gravesite for the presentation. They placed American flags on his grave, too. Mingay would have been proud. He was patriotic to a falut, and he nurtured vivid memories of his 10 moinths of combat duty with New York's famous "Fighting Sixty-Ninth" regiment during the Civil War. In fact, when Warner Brothers was filming the "The Fighting 69th" with James Cagney, the studio employed Mingay as a technical consultant. A studio limousine picked him up each day at his Tujunga home and whisked him out on location. Capt. Mingay got a kick out of having a school named for him, too, because his formal schooling ended when he turned 12. It was on Dec. 5, 1946, just two days after his 100th birthday, that Capt. 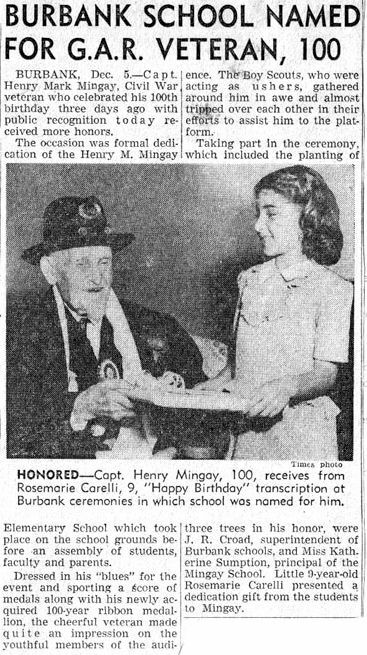 Mingay dedicated Mingay School by turning the first shovelful of earth in the planting of three live oak trees. 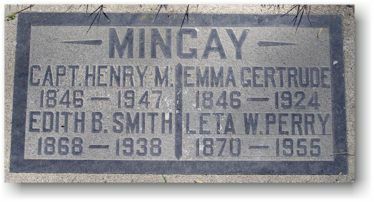 Not long after the dedication, on April 22, 1947, Mingay died. Henry M. Mingay lived a colorful and varied life. He was just four years old when he came to this country from Filby, England, with his mother and five brothers and sisters. His father had made the crossing a few months earlier to find work as a shoemaker. The family settled in Saratoga Springs, N.Y.
Young Henry was a natural ham and loved to entertain friends with his Irish brogue. A noted actor of the day, Joseph Jefferson, offered to help him launch a career as a comedian, but Henry's parents declined the offer. At the age of 12, Mingay became an apprentice printer at a newspaper. One of his duties was to deliver messages between the telegraph office and his shop. On April 14, 1861, he was in the telegraph office when the wires clicked out the news that Fort Sumpter had been fired upon. Mingay enlisted immediately. After the war, Capt. Mingay returned to Saratoga Springs and learned the newspaper business. While still a young man, he traveled west to Colorado where he owned and operated the Canon City Clipper and the Florence Daily Tribune until 1909. That's the year he headed for California. He made his home in Glendale for many years. Mingay was married twice. He and his first wife, Emma Rockwell, were married in 1867; they had several children. After Mrs. Mingay's death, Henry remarried - when he was 99 years old! This time, his bride was Glendale clubwoman Aimee Cleveland Hennessy, a widow. 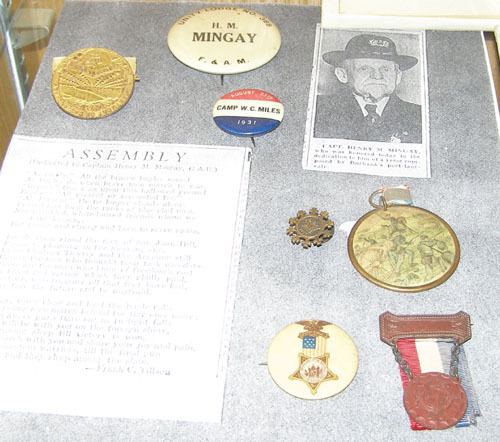 Before he died, Mingay turned over most of his medals and his GAR hat to Mingay School officials. The medals were displayed in the main hallway until last year when the school was vandalized. 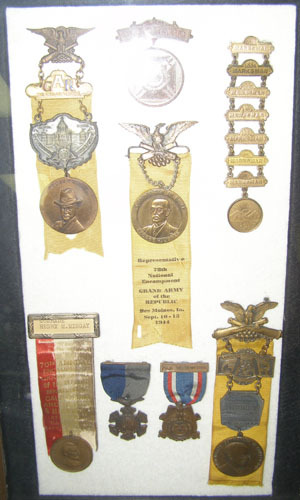 Mrs. Elaine Fritz, principal, said that vandals ripped the medals from the their velvet mountings. 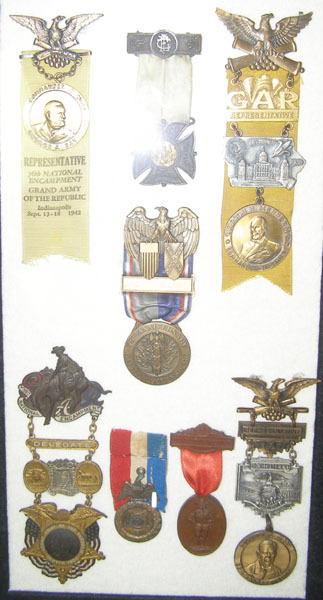 Mrs. Fritz hopes she can display the medals again someday, but the ribbons, she fears, are torn beyond repair. There's still a large photo of Henry M. Mingay in the hall, though, and Mrs. Fritz says children have been walking past the picture during the last week and saying, "There he is!" For the first time in years, she said, the children are really aware of Mingay's identity. "When your school is named for Washington or Lincoln, you know who it is," Mrs. Fritz said. "But somehow Henry M. Mingay got neglected. We're turning over a new leaf, now. We've made a point of finding out who Mingay was and making the children aware. Even the youngest pupils know who he was. And I think the story carries an important message with it: You don't have to be a national hero to be important. You can be a local patriot." My name is Robert McLernon, and I live in Springfield, Virginia. I have researched the Irish Brigade for 21 years, and I noted the story of Henry Mingay of the 69th NY with great interest. Henry M. Mingay age 18 years. Enlisted at Schenectady, to serve three years, and mustered in as private, Company D, on August 29, 1864. Promoted to sergeant on March 22, 1865. Returned to ranks on May 13, 1865. Mustered out with company on June 30, 1865, at Alexandria, Va. His name is also borne as Henry A. But wait! The real Henry Mingay story is somewhat at odds with the journalistic version. Read "Captain Henry Mingay: A search for the truth" by Tom Gilfoy.